April 15 to 26. You can grab your tickets here. Choosing to work within the many facets of our multicultural community, Con Nats has framed Haircuts around multiple narratives that serve to remind us how similar we all are under our various cultural differences. Haircuts is currently on at the really lovely Greek Theatre in the Addison Road complex, which can be a trick to find but the clever crew have left little sign posts everywhere that are easy to follow to gain access to the venue. The stage is broad and distant from the audience, but Nat’s play, which is quite large with a lot of characters, fills the theatre with its vibrant love of all facets of the human condition. 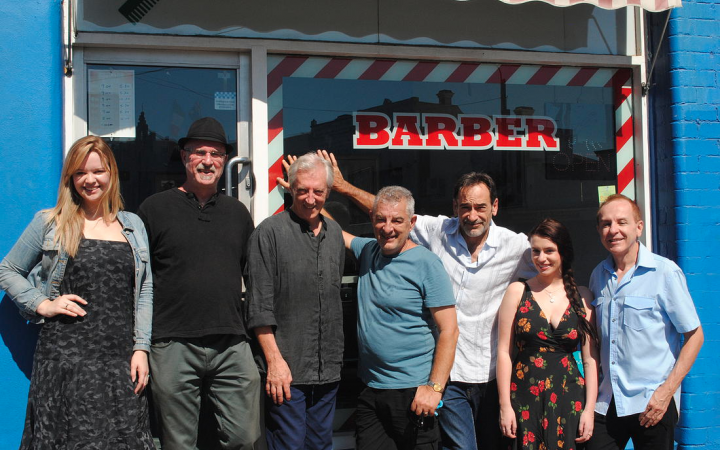 Haircuts is currently showing as part of the Greek festival of Sydney, and the night I attended it was filled with happy, laughing members of that community, one that has no problem with a whole-hearted belly laugh at itself. After all this is the community that saw Nick Giannpopoulis and Mary Coustas (Wogs out of Work and Acropolis Now) entire careers out of very simplistic parodies. Not to mention Nia Vardalos who achieved something similar in the United States with My big Fat Greek Wedding. In many respects, Con Nats explores similar territory with Haircuts, examining machismo in different cultures, and comparing Greek and Italian macho males against the white Aussie version. The difference turns out to be almost entirely cosmetic, as both the men who represent these roles, John Derum as the white Anglo monosyllabic father and Adam Hatzimanolis as the larger than life Greek father Costa, have displaced relationships with their children, and much of the plays narrative centres around the complexity of these relationships as the two fathers struggle to connect with their kids. Stanley, beautifully performed by Richard Hilliar, is the troubled son of the father figure played by Derum and has been let down through lies and secrets that plague his attempts at adulthood. Then, Tina performed by Demitra Alexandria suffers from the age-old problem of being female, so that when she wants to help her father Costa in keeping his business afloat, all he sees is her femininity and she finds she has to navigate a series of hurdles so that change can come in a way he never suspects is from her ingenuity. It is in this area that Haircuts loses its way, as the relationship played out between Costa and his daughter has too many loose ends, and Tina gets lost among the hyper-masculine parodies of the funny and ultimately “endearing” misogynists. It’s hugely disappointing to see in a play with seven cast members, that only two are female. Women are missing from this play in many ways, including in the touching and beautiful scenes between Hilliar and his mother played by Barbra Gouskos whose primary narrative arc is that she was missing from Stanley’s life all along. This presents a strange disconnect where we are at once being told serious consequences of an absent mother, while women are too underrepresented in the play given the size of the emotional world it intends to navigate. However, if this meant a problem for me, Haircuts still calls forth many laughs from the mostly Greek audience who we know love a good laugh at themselves. This in itself is endearing. Indie theatre lovers such as myself spend a lot of time in small theatres that usually house the same crowd – if not in actuality, then in kind. To sit in a theatre filled with Greek people belly laughing at themselves and their cultural stereotypes was a rare and precious pleasure, and I did get the feeling I had been warmly invited into a world I know very little about. Lex Marinos directs Haircuts, placing the cast on the stage in a ‘waiting room’ format against three barber chairs that sit centre stage. They serve as the primary props in a very clever set designed by Rachel Scane that is as beautiful as it is simple. A screen behind the action projects different images that represent scene changes – this works very well actually. Some of the words were lost when actors, particularly Derum, have their back to the audience, but this didn’t prove too much of a distraction as Marinos allows Nats’ words to overtake the perspective and we are able to stay with the plotting. A couple of particularly lovely scenes where monologues intersect needed a touch more rehearsal for Nats’ point to come across with power, but on the whole the cast are strong and delightfully witty. Standouts in the cast are Richard Hilliar and Barbara Gouskos, in particular a scene where they meet as mother and son is the highlight of the show. 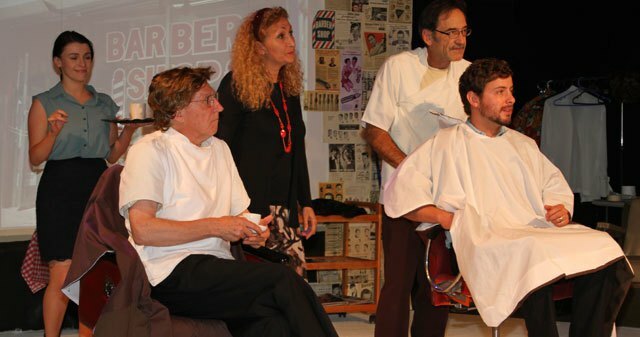 Haircuts is simple – just as Lex Marinos says in the program notes. Like so many of these Greek parodies, it exudes the passion and warmth of the culture it seeks to represent. It might not be a perfect night at the theatre, but the atmosphere is engaging and one finds oneself smiling and relaxing into a delightful shared humanity. your blog and definitely will come back from now on. I want to encourage yourself to continue your great job, have a nice weekend!